“How will you pass your culture on to your children?” was a loaded question I was recently asked. Another convert had been thinking hard about that question and I think, she hoped that I would have some great insight. But honestly, I didn’t. I don’t. I concede that I haven’t worried too much about passing on my (new) Jewish culture to my children. With my family history, I’m more worried about giving them a loving, sane environment. I don’t worry so much about that environment being Jewish. But then again, I am spoiled. My husband is studying to be a rabbi. He gives really good public relations for Judaism. But then have you heard what they say about the rabbi’s children? Maybe I should be more worried. I have seen others go through the painful process of watching their children become less and less religious and observant, of not wanting to be Jewish or identify as Jewish. And oy, was it painful to watch! Just thinking about it makes me feel like my heart is drying up into a little raisin-like shape. I can’t imagine how painful it is when the parents have worked their butts off to adopt Judaism as adults. My convert friend worries that she might overwhelm her children with too much information “for fear of the children drifting from their Jewish roots.” I can see myself doing the same. Mommy will probably be too happy to help Baby learn Hebrew. (At least, until Baby’s understanding exceeds Mommy’s and then G-d willing, Daddy will take over Mommy will overdose on things like this because she didn’t get them in her childhood.) It would be heartbreaking if my children drifted and even more heartbreaking, if I could have avoided it somehow. I like to think that if I can pass on how happy Mommy is with the culture and religion she’s adopted, that Baby will be happy, too. Because I’ve also seen what happens when the rabbi’s kid turns out great and loves Judaism with such a passion that it’s infectious. That’s the kind of passion I want to exude. That’s the kind of passion I hope my children will share. That’s the kind of stuff that keeps me up at night. Am I being passionate enough? How can I get more passionate? And yes, I’m worried about explaining that though Auntie takes her celebration of Halloween very seriously, we’ll only be dressing up for Purim. But the craziest thing is that Auntie is pretty supportive of having Jewish nieces and nephews. She’d probably tell them Christmas wasn’t as cool as Chanukah because she’s celebrated both. And maybe, they’ll believe if it’s not coming from just me alone. And I guess that’s just it. I have to hope. I have to hope that if I surround myself with the right people. The infectious sort. The kind that remind me why I wanted to be Jewish in the first place. That my children will make the same choice I made and they’ll want to be Jewish, too. You hear that G-d? No funny business. I don’t think my heart could take it. Rabbi Marc Angel of Shearith Israel once said that <>Sometimes we have to trust in the best in people, and let Hashem do the rest.<>I think the same applies to children. I once dated a girl that was the daughter of a rabbi and she had been off the derekh, yet she still wanted to cling to elements of Yahaduth even though she didn’t believe in it. While there are a lot of reasons why a child may reject Jewish upbringing, the Hagadah for Pesah shows us that no matter what their choice we must engage them where they stand. It also teaches us that even while there may be children who reject, there are children who accept. Yet, I feel, they have to accept it at some point because they themselves sense their place in Yahaduth, and feel a connection to Hashem. If this is the basis for why they live as a Jew, it will last beyond their childhood.My major fear would be, not that they search out their own reason to believe or not to believe, but that they don’t search it out. Before my grandmother, of blessed memory, passed away she asked me, <>What do you believe?<> I didn’t have a clear answer for her. For years, I thought I had a pretty good handle on things, but her question threw me off a bit, since it came out of no where. She then said, <>At some point you are going to have to believe in something, not because we taught you this or that, but because you have found it to be true for yourself.<> Her words started a spark in me, and when she passed away and I felt like I needed to be more religious, not because it was what she or my family wanted, but it was something I began to want. That led to one thing, and now here I am.The basic thing is that children have to be given all the tools to make an informed decision, about who they will be and not be as Jews. If you as a parent have done your role, based on the Shema, you have given them the tools. What they build with them, is up to them. 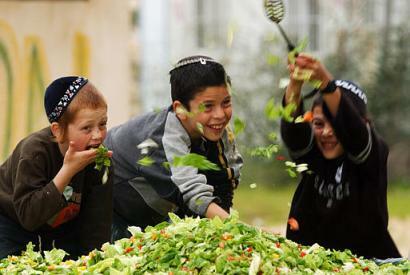 Some children take those tools and build beautiful lives based on Torah, and some do not. Yet, in the end it is their decision to make.